This measurement procedure is intended to measure propellershaft runout for prop shaft systems with2-or-3 U-joints only. 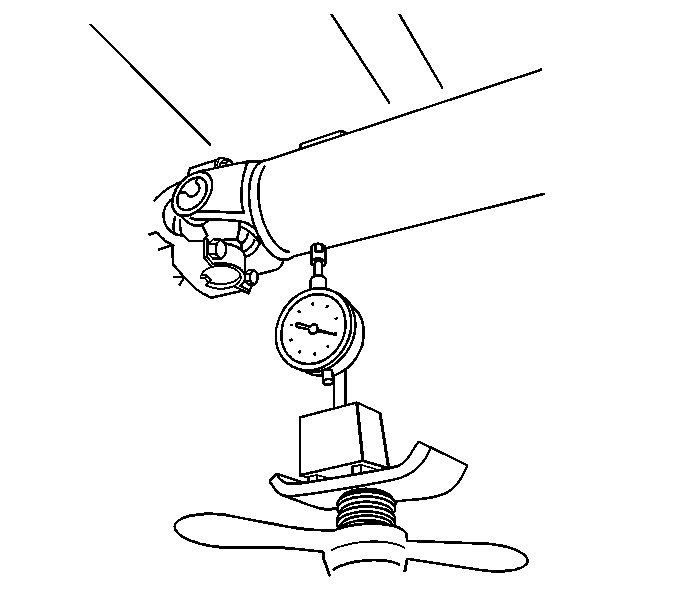 This is not for propsystems with only 1-U-joint, or with only constantvelocity (CV) joints, and/or coupler assemblies.When measuring runout of propeller shafts, do not includefluctuations on the dial indicator due to welds or surfaceirregularities.Always inspect the runout of any replacement propellershaft. Raise and support the vehicle. On vehicles with solid axles,ensure that the drive axle is supported at ride height –vehicle body supported by suspension components. Ensure the wheelsare free to rotate. 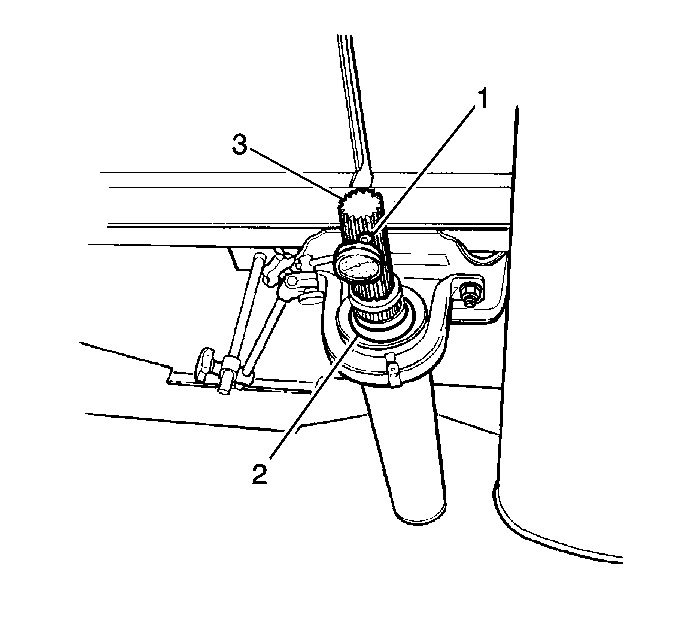 Refer toLifting and Jacking the Vehicle.Place the transmission in NEUTRAL.Clean the circumference of the propeller shaft or shafts ofany debris and/or undercoating along the front-(1),center-(2), and rear-(3) positions.Inspect the propeller shaft or shafts for dents, damage,and/or missing weights. Any propeller shaft that is dented ordamaged requires replacement. For 1-piece and 2-piece prop systems, mount theGE-7872Magnetic Base Dial Indicator Set, or equivalent, or theGE-8001Dial Indicator Set, or equivalent, to the vehicle underbody or to a servicestand positioned just clear of the U-joint yoke weld on the propshaft. Rotate the drive axle pinion flange, torque tube inputflange, transmission output, or transfer case output flange by handwhile taking runout measurements of the prop shaft or shafts. Theprop shaft will rotate more easily in one direction than in theother. If necessary, the tire and wheel assemblies and even thebrake caliper assemblies can be positioned and supported aside, orthe brake drums can be removed from the drive axle to provideeasier rotation of the prop shaft or shafts.For all prop systems, measure and record the runout at eachU-joint welded yoke location-(1,-3) and atthe center-(2) of each prop shaft.For 1-piece prop systems, proceed tostep-10. For 2-piece prop systems, perform the following inspectionsand measurement of the stub shaft:Mark the mating position for each end of the prop shaftcontaining the slip yoke, then remove the shaft.Inspect the prop shaft support bearingassembly-(2) for damaged rubber components, worn bearingor bearings, or a damaged/cracked bracket which could be affectingthe runout of the propeller shafts.If the support bearing assembly exhibited any of theseconditions, it requires replacement before proceeding.Inspect the support bearing assembly-(2) for looseor missing shims/washers if equipped. Reinstall correctly orreplace any shims/washers as necessary to ensure proper alignmentof the support bearing assembly.Position theGE-7872Magnetic Base Dial Indicator Set, or equivalent-(1), or theGE-8001Dial Indicator Set, or equivalent-(1), approximately13-mm (½-in) from the end of thestub shaft-(3).Record the runout measurement at the stub shaftsplines.Compare the prop shaft runout measurements recorded to therunout tolerance specifications. Refer toPropeller Shaft Runout Specifications.If the prop system has a U-joint at the transmission ortransfer case output flange, and if the prop shaft runoutmeasurements exceed runout tolerance specifications for that propshaft at that location, or at the stub shaft if part of the frontshaft, perform the following:Inspect the deflection of the transmission or transfer caseoutput shaft for indications of a worn or damaged bushing whichcould be affecting the runout of the prop shaft. A leaking transmission or transfer case output shaft seal maybe an indication of an output shaft bushing concern. If the transmission or transfer case output shaft bushing isfound to be worn or damaged, the bushing must be replaced beforeproceeding.If the transmission or transfer case output shaft bushing wasreplaced; re-measure and record the runout of the prop shaft at thesame locations measured previously.Compare the prop shaft runout re-measurements recorded to therunout tolerance specifications.If the prop shaft runout re-measurements still exceed runouttolerances at the same location or at the stub shaft, if part ofthe front shaft, the prop shaft requires replacement beforeproceeding. Check the runout of the replacement prop shaft.If the transmission or transfer case output shaft bushing wasnot found to be worn or damaged, the prop shaft requiresreplacement before proceeding. Check the runout of the replacementprop shaft.If the prop system has a U-joint at the drive axle pinion ortorque tube input flange, and if the prop shaft runout measurementsexceed runout tolerance specifications for that prop shaft at thatlocation, or at the stub shaft if part of the rear shaft, performthe following:Mark the mating position for each end of the prop shaft, thenremove the shaft from the pinion input, or torque tube inputflange.Rotate the shaft 180-degrees from its originalposition.Reinstall the shaft to the pinion or torque tube inputflange.Re-measure and record the runout of the shaft at the samelocations measured previously.Compare the shaft runout re-measurements recorded to therunout tolerance specifications.If any of the runout re-measurements still exceed runouttolerances, perform the following:Inspect the pinion or torque tube input flange runout todetermine if it is affecting the runout of the prop shaft. 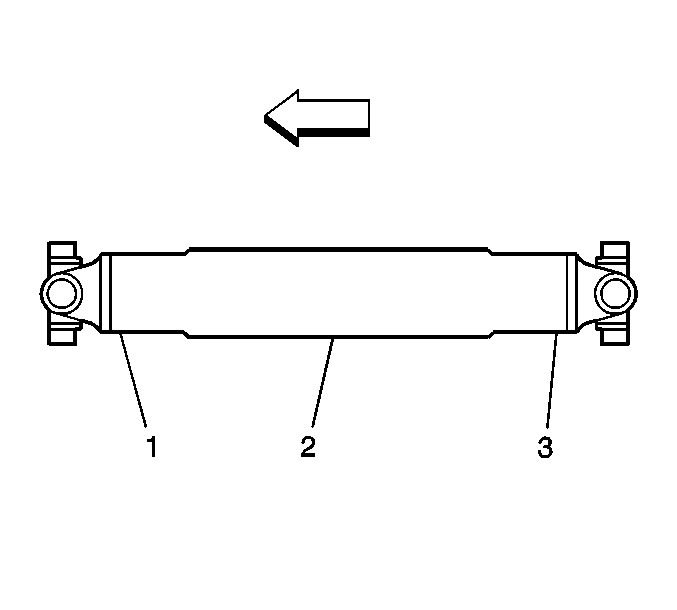 Refer tothe appropriate procedure:Torque Tube Input Flange Runout Measurement,Pinion Flange Runout Measurement, orDifferential Pinion Input Shaft Runout Measurement.If the pinion or torque tube input flange runout exceedsrunout tolerances, the flange must be re-indexed or replaced tobring the runout within tolerances before proceeding.If the pinion or torque tube input flange was re-indexed orreplaced, return the prop shaft to its original relationship whenreinstalling the shaft to the flange.If the first measurement of pinion or torque tube inputflange runout was within tolerances, the prop shaft requiresreplacement. Check the runout of the replacement prop shaft.If the pinion or torque tube input flange was re-indexed orreplaced, re-measure and record the runout of the shaft at the samelocations measured previously.Compare the shaft runout re-measurements recorded to therunout tolerance specifications.If any of the runout re-measurements still exceed the runouttolerances, remove and rotate the shaft 180-degrees fromit's original position to the pinion or torque tube input flangethat has been re-indexed or replaced.Reinstall the shaft then re-measure and record the runout ofthe shaft at the same locations measured previously.Compare the shaft runout re-measurements recorded to therunout tolerance specifications.If any of the shaft runout re-measurements still exceed therunout tolerances, the shaft requires replacement. Check the runoutof the replacement prop shaft.For 2-piece prop systems; if the prop shaft runoutmeasurements at the welded yoke mating to the slip yoke exceedrunout tolerance specifications for that prop shaft at thatlocation, perform the following:If the stub shaft is keyed to ensure proper alignment of theslip yoke, then the prop shaft requires replacement.If the stub shaft is not keyed, mark the mating position foreach end of the prop shaft, then remove the slip yoke from the stubshaft.Rotate the shaft 180-degrees from it's originalposition.Reinstall the slip yoke to the stub shaft.Re-measure and record the runout of the shaft at the weldedyoke to slip yoke location.Compare the shaft runout re-measurements recorded to therunout tolerance specifications.If the prop shaft runout re-measurements still exceed runouttolerances at the welded yoke mating to slip yoke location, theprop shaft requires replacement. Check the runout of thereplacement prop shaft.